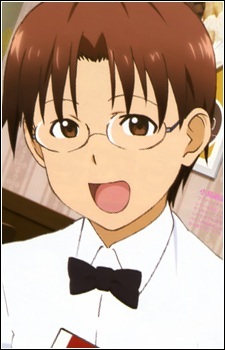 Height: 172 cm Souta is a 16-year-old high school student recruited by Popura to become a new employee at the family restaurant Wagnaria. He is enamored by cute things and thus favors Poplar over the other employees due to her cute appearance. He voices his thoughts out loud and occasionally offends his co-workers, often resulting in him getting punished by them. He usually finds his co-workers and the rules of the restaurant to be strange, but he still has an attachment to his job. He is able to adapt quickly to his job at the restaurant. He has three older sisters and it is because of them that caused his dislike for older women as he had been tormented by them all his life. He received hand-me-downs from his sisters when he was young, giving him the appearance of a little girl. He also has a younger sister in elementary school who is almost as tall as he is. Despite his problems, Inami asks Souta to cross-dress, using the name Kotori, when her father comes to visit her at work.